Today, a recipe. Scripted by Yours Truly. 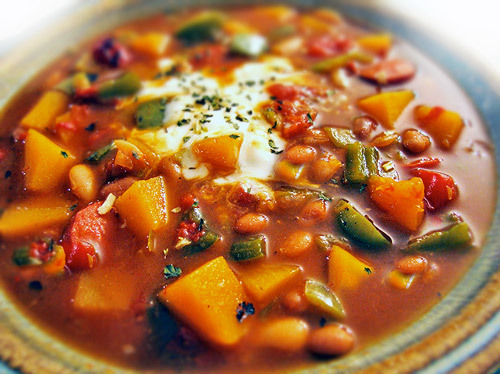 Our favorite gluten-free chili- hearty winter comfort. A chilly winter light slices into a SANTA MONICA apartment and illuminates every cobweb. (Obviously, a certain individual has been neglecting house work again). Said individual sighs audibly. Glances sideways into the mirror hanging above the kitchen sink cluttered with coffee spoons, grilled cornbread crumbs and half-filled tea mugs. She could never pass for Martha Stewart. Not in a million years. Good gravy. Look at all the dust balls. So what. What's a dust bunny or two? I’ll vacuum later. Or next Tuesday. By Karina Allrich February 2006. We always improvise our chili and no two recipes are ever exactly the same, but this is an approximation of this week's recipe. Sometimes I'll add spicy organic sausage. Pieces of organic free-range chicken or turkey would also work. Vegans- use vegetable broth and garnish with chopped herbs, scallions or crumbled corn chips.